U.S. Sen. Michael Bennet leads a group of constituents interested in legislation to protect the Hermosa Creek watershed on a Sunday morning hike on the Hermosa Creek Trail. Bennet has introduced a bill in the Senate to protect the watershed based on work done by the Hermosa Creek Workgroup. 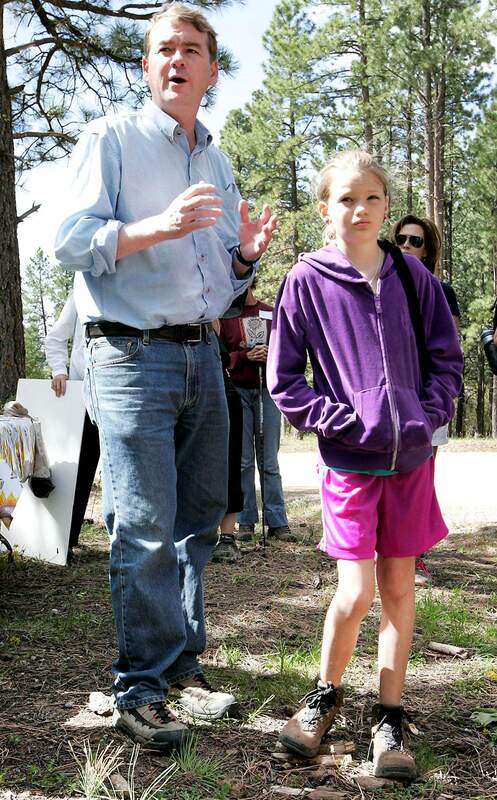 U.S. Sen. Michael Bennet speaks to supporters with daughter Caroline about his proposed legislation to protect the Hermosa Creek watershed Sunday at the Hermosa Creek trailhead. 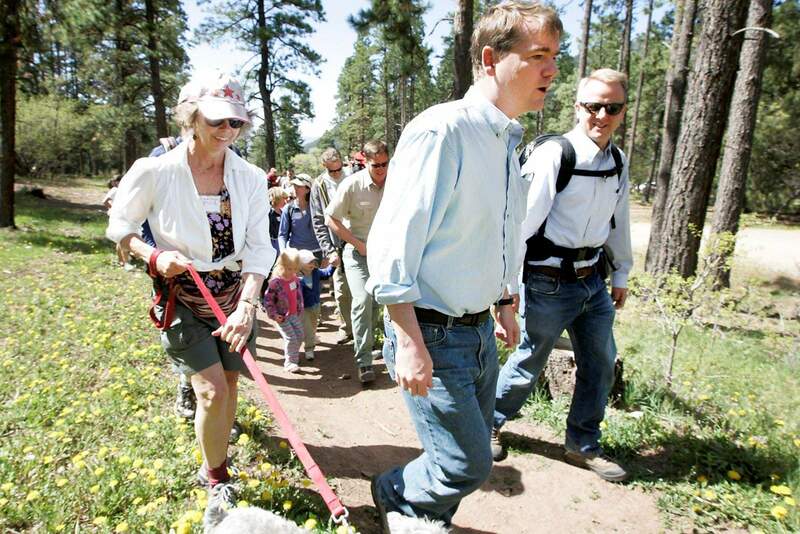 Fresh off the campaign trail, U.S. Sen. Michael Bennet spent Sunday morning hiking the sunny trails of Hermosa Creek. Members of several local groups including the San Juan Citizens Alliance, the Great Old Broads for Wilderness, the Durango Historical Society and the Durango Water Commission gathered for a hike hosted by Bennet and his family. One branch of Bennets four-day tour throughout the Four Corners, the event served as a platform for the senator to discuss and gather feedback on a bill that would help protect and preserve the Hermosa Creek Watershed. The bill is based on recommendations submitted by the Hermosa Creek Workgroup, a group composed of conservationists, water officials, landowners, outdoor recreation users, and several other groups of residents interested in preserving the Hermosa Creek area. This project represents the best of Colorado, Bennet said. This is a diverse group of people with diverse interests  not demanding that their own needs be met, but respecting all interests and uses of the area, said Bennet, who hinted that this type of cooperation might be helpful in some of Washingtons deficit conferences. When the stakeholders agree, it makes it that much easier to speed things along, he said. The group was challenged with the difficult task of proposing legislation that would fairly protect an area in which so many are invested, said Marsha Porter-Norton, group facilitator. The Hermosa Creek Workgroup met for 22 months discussing pros and cons and submitting various proposals, Porter-Norton said. Bennet, who as senator has visited Durango several times, said he became involved with the Hermosa Creek project through his predecessor, Ken Salazar. The issue was something Salazar and Bennet had discussed early on and that some Salazar staffers, who are now Bennet staffers, had been involved with. Support like Bennets is key in helping groups like the Hermosa Creek Workgroup achieve their goals, Porter-Norton said. Its important. We cant do it at a state level. We need federal, bipartisan legislation, she said. The Hermosa Creek project, which likely will be referred to as the Hermosa Creek Watershed Protection Act of 2011 in Bennets bill, is one part of the Hermosa Creek Workgroups five-part plan to protect several wildlife regions. The group is slated to begin work on its next conservation project related to the Animas River on June 23, Porter-Norton said. Currently, Bennets team is focused on the Hermosa Creek project. However, they will continue to stay close to the process, Bennet said. The community has established a process that works well in this region, he said, touting the workgroup for its transparent and open process and its ability to work toward common goals. Members of the workgroup were not appointed, Porter-Norton said. The workgroup made efforts to create a transparent and locally crafted plan by allowing anyone who showed up to a meeting to become a member and contribute input, she said. This is a diverse, broad-based, community connection, she said. Bennets team will do its part to maintain the open nature of the process by posting a draft of the bill on his website Tuesday, a spokesman said. Bennet, who also circulated copies of the bill at the hike, hopes to make the draft public in order to invite local input before bringing the legislation forth to be finalized, he said. We want to bring people together from the ground up, he said.